Following a delay, the battle royale mode for free-to-play arena brawler Battlerite is slated for release in September – but as a standalone, paid-for game called Battlerite Royale, distinct from the original Battlerite. 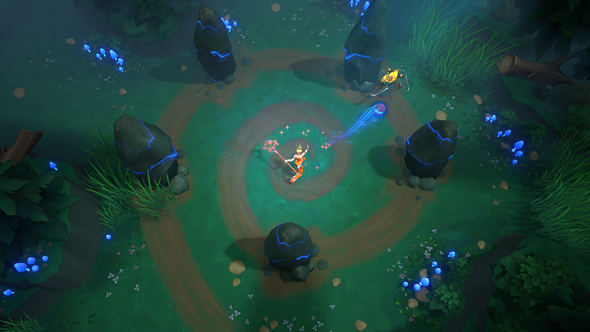 “With the constraints from Arena limiting us and after seeing the huge reaction from Battlerite Royale’s announcement, we made the decision to protect the integrity of both experiences and create a new game instead of a new game mode,” developer Stunlock Studios wrote in a blog post August 9. While Battlerite Royale is keeping the combat and input systems of the original, developing a separate game will allow the studio to build new matchmaking systems, a purpose-built UI, and new tutorials for the separate experience. On the Battlerite subreddit, a Stunlock Studios community manager wrote that players who have bought into early access or who own the All Champions Pack will get a discount on the purchase of Battlerite Royale. This shift from a new free gamemode to a separate, paid game hasn’t gone over very well with some Battlerite players, though. “So hype us for months about a new game mode and then ask money from people who already bought the game?” one player asked in the comment thread. Others expressed similar frustration at paying to play the original Battlerite and being asked to open their wallets again for something that had originally been described as a free update. It’s unclear whether Battlerite Royale will have a paid early access period prior to a free-to-play launch, like the original Battlerite, or if it will remain a paid title when it launches. Stunlock Studios plans to reveal more about Battlerite Royale, as well as a more detailed 2018 roadmap for both games, on Monday, August 13.